Happy Mother's Day everyone. Short and sweet today. 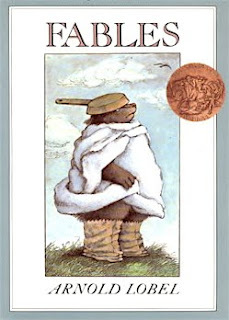 The Great Monday Give (where I give away a vintage or a newish copy of a vintage book to one lucky reader) today is an almost-brand-new-but-with-a-small-inscription-and-a-slight-tear-on-the-dust-jacket copy of the Caldecott winning masterpiece by Arnold Lobel, Fables. To be entered to win this fine book, simply leave a comment on this post before 11:59 PM on Sunday, May 16. A winner will be selected at random and announced here the next day. I love Arnold Lobel. I've not seen this book but love to win it. If I keep entering, I'm bound to win one sooner or later! This cover makes me smile! This looks like a wonderful one to read to the kiddos! I haven't entered in a while...I love Arnold Lobel and this is one we don't have. Thanks so much for the chance to win this one! Looks like a great book! This is my first try. Fingers crossed. We are an Arnold Lobel-loving household. It'd be lovely to add this to our collection. I remember reading this one in elementary school! We had a unit on fables and fairy tales. I love these, but haven't shared them with my kids yet. Lobel is among the best. Thanks. yes, please! another wonderful little gem! This looks like a wonderful book that my son would love. that one looks familiar... love the wistful bear. I'd love to be entered to win FABLES! This is one we check out from the library all the time. Here's hoping we won't have to check it out anymore!! We haven't read this one yet! OO!! Great choice! Thanks you for the chance to win. Oh, this book was my kid's favorite book. I would love to share it with my granddaughter! Oh my girls would get a kick out of this!!! Thanks for the giveaway! Would be lovely for my son who's learning english. Why, oh, why have I never seen this blog before?? I love what you are doing, keeping the great old books alive. Thank you. And if I win your book I can read it to the grandchild I have coming in the fall. I would love to have a copy of this book. Thanks for the chance of winning it. I remember this book! My brother had it when we were younger.